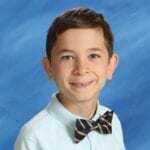 Our intrepid reporter, Matthew L., interviewed Newton Learning Center Northern Nevada student, Josh G., who likes zebras better than hippos. Q. What do you like about your new school Newton? Q. What is your favorite pastime outside of school? Q. Would you rather have a pet zebra or hippopotamus? Q. If you could take over the world, what would you do? Q. What’s your favorite restaurant to dine at? Q. If a genie popped out of a bottle, what would your three wishes be? Q. What was one of your most thrilling experiences? Q. What is your favorite class subject?